Happy Sunday friends!! Of course, you know what this day brings....right? 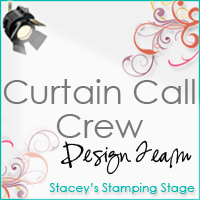 Another color challenge courtesy of Stacey's Stamping Stage blog! 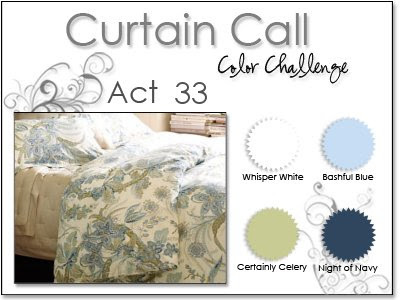 Here are the colors this week! I don't know what made me think "wedding" with these colors...but that is exactly what came to mind. :) Here is my card for this week! Instructions: Fold blue cardstock in half to make card base, and round the bottom corners. 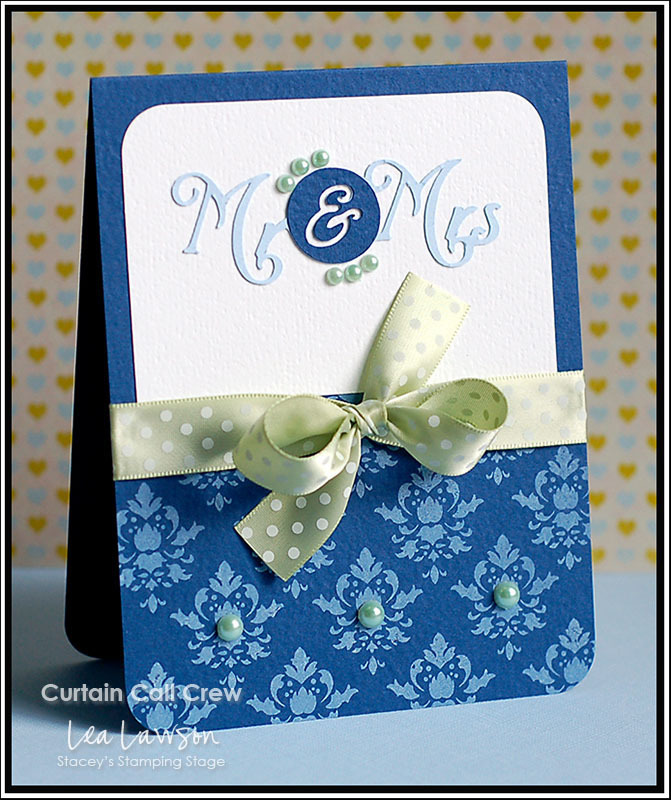 Stamp a damask pattern to the bottom of the card. Round the top corners of a white cardstock block, and adhere to the top of the card. Tie ribbon around the seam. Cut the sentiment at 1" using the Cricut Expression and Tie the Knot cartridge. Layer together, and adhere to the white cardstock block. Accent the card with light green pearls. We have a new addition this month as well! 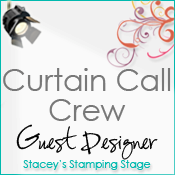 Please help us give her a warm welcome to the Curtain Call! Well, that is all I have for now! I hope that your weekend has been fabulous! I got to watch my brother play football in an all-star game....so I am a happy girl!! Gorgeous card, Lea! You have such a way with gems, and the pearls are a perfect touch. I must get myself a damask stamp set soon! Soooo pretty, love what you did with the pearls. This is so elegant, Lea. I love those colors together. Such a stylish wedding card! I love your use of the colour combo. Great wedding card Lea! Love the stamped damask panel and the ribbon finishes it off so beautifully! Beautiful wedding card - I wouldn't have thought to make a wedding card with these colors but you worked it out! The damask and pearls are so pretty! I like it! I also like that you used your Cricut for lettering. I don't know why I don't consider this more! Your damasks are just perfect! I love it, such great colors for a wedding card.